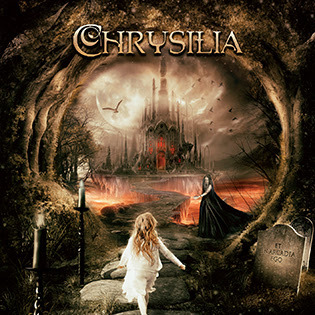 Chrysilia is an Athens, Greece based symphonic folk metal band, with a line-up consisting of six musicians. The eye catcher is no doubt the multi-talented front woman, vocalist and co-founder Chryso Stamatopoulou, who is a classically schooled singer with an operatic touch. Along her side she finds guitarist Teo Ross, Jim Ramses on bass, Simon Kay on drums, John Matzakos on keyboards and Odysseas on violin. Co-founder Elias Pero and producer Bob Katsionis also play important roles, though not in the spotlights. Chrysilia, named after Chryso’s daughter, was founded as a band early in 2016 by Chryso and Elias, but started as a concept quite a bit earlier. Based on the evolvement of Elias’ compositions from his 90’s epic power metal band Sovereign, the concept project slowly but surely steered towards being a band, culminating (for now) in the release of their first full-length. Et In Arcadia Ego is a concept symphonic folk metal album with a romantic edge, a description to which the band would like to add the term ‘soundtrack’, due to it sounding like a metal-based motion picture soundtrack, according to the band. Lyrically based on the concept of Arcadia, an variously interpreted mythological dreamland, the story of Et In Arcadia Ego is a metaphorically translated version, telling about a journey in time and fantasy, myths and reality, fairytales and politics, life and death itself, through the eyes of a girl growing up. Of course her name is Chrysilia. The setting is of course the Peloponnese, which is said to be where Arcadia is located. Concept-wise this is an exceptionally well-thought-out album, also expressed in the title, which is an often quoted, never fully fathomed phrase. Hopefully the band managed to translate all this into the music itself as well. Opener By The Gates Of Ypsus is the first sign they indeed might have done just that. If you ever wondered what you could expect from soundtrack metal, this is the perfect song to be tutored. Like in a motion picture soundtrack there’s an abundance of soundscapes and intermezzos depicting either emotions, atmosphere or changes in the story line. Bombastic, but with the right amount of power and heaviness to classify as metal, this song definitely sets the tone for what promises to be a great album. The music provides a perfect frame for Chryso’s vocals, augmenting rather than supporting them. More than once a strong opener spells disaster for the rest of an album, simply because its quality cannot be matched, let alone surpassed. In this case, however, things are very different. The great prologue finds its equal in its successor called The Menalon Trail, another cleverly composed, powerful song in which the music augments the vocals in a similar way. Up next is the mandatory power ballad, Desperate Wings, in which Chryso’s romantic side takes over, a role that fits her like the proverbial glove just as much as the role of power vocalist fits her. Most striking in this one is Odysseas’ violin work though, leading the song from the depths of its composition. As a bonus the album ends with an orchestral version of this song, in which the combination of Chryso’s voice and Odysseas’ swirling violin is even more convincing. That one, however, is to be found only at the end of the album. Before you get there, there’s much more to enjoy on Et In Arcadia Ego. Whether you pick the sweet Chrysilia that grows from a sweet lullaby into a full-blown folk song, the beautifully tensive and emotional The Fifth Season, with, once again, great violin work or the slow, relatively heavy King Of A Stellar War, all songs as well as the performing musicians’ contributions breathe the same high quality. In all honesty, I could have picked any song in this summary, I really cannot find a mediocre song on this album, which I consider an impressive achievement. Having thoroughly heard and enjoyed this, it’s obvious the band’s addition of the term ‘soundtrack’ to the description of Chrysilia’s musical genre is spot on. Parts of this release could indeed very well be taken from a motion picture soundtrack, but when compared to an actual soundtrack there’s an essential difference. Unlike in real soundtracks the music on Et In Arcadia Ego is coherent at all times, with logical variations in speed, heaviness and rhythm without losing the required variety and atmospheric impressions a concept album needs. When you look at this from a strictly metal-oriented point of view you might not be fully satisfied, simply because it’s not a pure metal album. Not even close I’d say, but that doesn’t change the fact I consider this one of the best releases of the year, if not the best. Music, rhythm and vocals are tuned and in sync to near-perfection and there’s a definite emphasis on atmosphere over power, although it in no way can be called a powerless release. This album has a little bit of everything without losing track or coherence. The compositions are works of art that have been thoroughly thought through to ensure music and vocals complement instead of co-exist. Sweet release, this one will rank high in my year list for sure. Highly recommended.